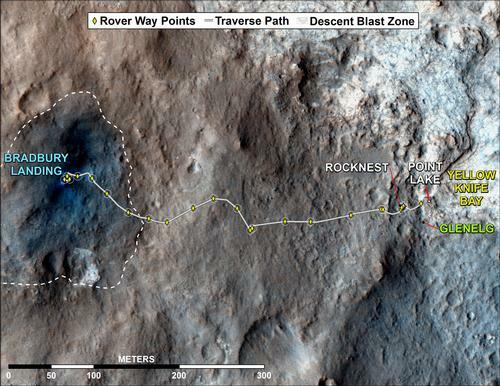 This map shows where NASA's Mars rover Curiosity has driven since landing at a site subsequently named "Bradbury Landing," and traveling to an overlook position near beside "Point Lake," in drives totaling 1,703 feet (519 meters). PASADENA, Calif. - NASA's Mars Curiosity rover has used its full array of instruments to analyze Martian soil for the first time, and found a complex chemistry within the Martian soil. Water and sulfur and chlorine-containing substances, among other ingredients, showed up in samples Curiosity's arm delivered to an analytical laboratory inside the rover. 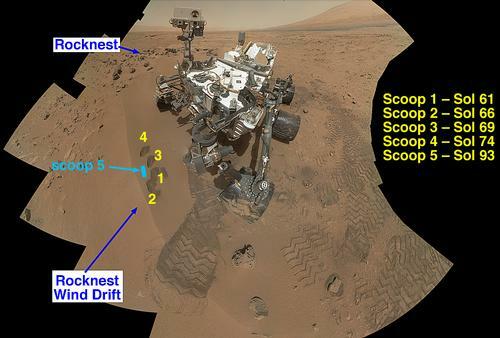 Curiosity is the first Mars rover able to scoop soil into analytical instruments. The specific soil sample came from a drift of windblown dust and sand called "Rocknest." The site lies in a relatively flat part of Gale Crater still miles away from the rover's main destination on the slope of a mountain called Mount Sharp. The rover's laboratory includes the Sample Analysis at Mars (SAM) suite and the Chemistry and Mineralogy (CheMin) instrument. 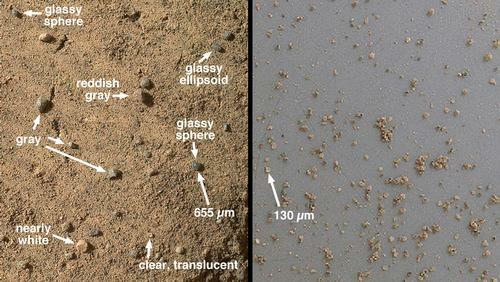 SAM used three methods to analyze gases given off from the dusty sand when it was heated in a tiny oven. One class of substances SAM checks for is organic compounds -- carbon-containing chemicals that can be ingredients for life. SAM tentatively identified the oxygen and chlorine compound perchlorate. 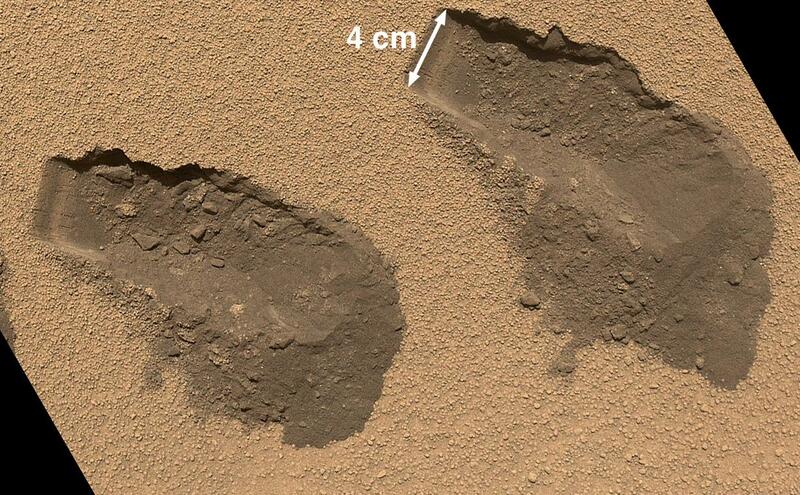 This is a reactive chemical previously found in arctic Martian soil by NASA's Phoenix Lander. Reactions with other chemicals heated in SAM formed chlorinated methane compounds -- one-carbon organics that were detected by the instrument. The chlorine is of Martian origin, but it is possible the carbon may be of Earth origin, carried by Curiosity and detected by SAM's high sensitivity design. NASA's Mars Science Laboratory Project is using Curiosity to assess whether areas inside Gale Crater ever offered a habitable environment for microbes. NASA's Jet Propulsion Laboratory in Pasadena, a division of Caltech, manages the project for NASA's Science Mission Directorate in Washington, and built Curiosity.